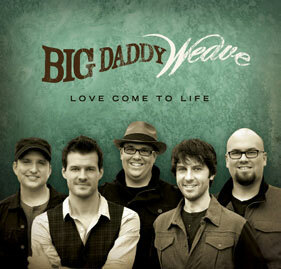 This is the first studio album from Big Daddy Weave in nearly three years and the band's label describe 'Love Come To Life' as the 'best album of their career'. "It's an album that came through fire - literally: the tracks survived a devastating blaze that swept through guitarist/producer Jeremy Redmon's house and studio" explains Word Entertainment. "This project has been three years in the making. We've faced failures and walked through personal disasters," agrees frontman Mike Weaver. Read More This is the first studio album from Big Daddy Weave in nearly three years and the band's label describe 'Love Come To Life' as the 'best album of their career'. This whole album is very honest, lyrically this is a band digging deep and being honest with the listener about how they really feel. For me, that's what makes the best songs. When a songwriter digs deep to say what they are really thinking without worrying what others will think of their views. The album does tend to have the traditional American rock pop christian sound that is very popular at the moment, but the quality of the record is as good as anything released at the moment. But what always makes a great album is the songs and this one opens with the acoustic Jesus Move, with added layers of atmospheric tones. I love the opening line "Let the power of God fall down on us... Let your Spirit of God pour out on us". It sets the tone to the whole album. The album then jumps into the more poppy than rock style of tracks for Love Come to Life and Different Love. Redeemed is a beautiful number towards the middle of the album, with a nice piano tone which is made even better by some great vocal work from frontman Mike Weaver. Mike has a great gutsy voice that most lead singers would love to even get close to. From the moment you hear the sound of the opening track, you know what you are going to get in style and sound. There isn't necessarily anything new in style or music, but what you do get is a whole album full of great, strong, honest songs with solid sound quality and production that will be please all fans of this band.